South Beach bed and breakfast travel guide for romantic, historic and adventure b&b's. 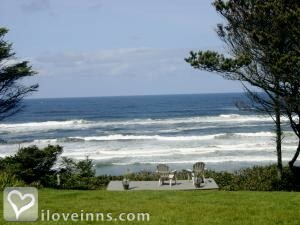 Browse through the iLoveInns.com database of South Beach, Oregon bed and breakfasts and country inns to find detailed listings that include room rates, special deals and area activities. You can click on the 'check rates and availability' button to contact the innkeeper. Located on Oregon's North Coast, on the south side of the Yaquina Bay joined by the neighboring cities of Newport and Seal Rock is South Beach. South Beach is near Gold Beach and is approximately seven miles long spanning from the Rogue River south to Cape Sebastian. South Beach and its surrounding areas offer endless recreational opportunities such as kayak tours which is a new and exciting addition to the many other equally relaxing family activities such as hiking and biking, picnicking, wildlife watching, fishing, and a lot more. South Beach also offers windsurfing, beachcombing, crabbing, and other water activities. There are also interesting attractions such as the Yaquina Bay Lighthouse and the marine exhibits at the Hatfield Marine Science Center. Do not miss out on the South Beach bed and breakfast because that is the best way to immerse yourself in the seaside culture. By Stone Crest Cellar B&B.